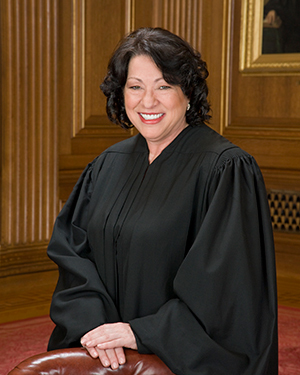 A public conversation with U.S. Supreme Court Justice Sonia Sotomayor will be held from 7 to 8:15 p.m. Sept. 2, an event co-sponsored by the Institute for Latino Studies. The event at Leighton Concert Hall in the DeBartolo Performing Arts Center, also sponsored by the Office of the President and Notre Dame Law School, is free and open to the public. Doors open one hour before the event. Sotomayor will discuss a wide range of issues with NBC News correspondent Anne Thompson, and the discussion will be moderated by U.S. Court of Appeals Judge Ann Claire Williams. Both Thompson and Williams are Notre Dame alumnae and Trustees. Nominated by President George H.W. Bush to the U.S. District Court, Southern District of New York, in 1991, she served in that role from 1992 to 1998 and as a judge on the 2nd U.S. Circuit Court of Appeals from 1998 to 2009. President Barack Obama nominated her as an associate justice of the U.S. Supreme Court on May 26, 2009.